Just lookit how cute these Sandy Claws cookies are! 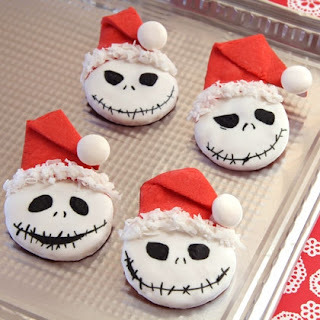 If you are a lover of Nightmare Before Christmas like I am, you will no doubt want to try making these creepy-cute cookies for yourself. And the recipe is super-easy (and can totally be made vegan)! Those are adorable! They look doable too. How have I never seen Jack Skellington cookies? I've seen a few Jack Skellington cakes. Are you planning to make these?